Skechers' recent quarterly report received a chilly reception, with shares dropping 17% the next day. After a whole year of bad news, is the worst now history? 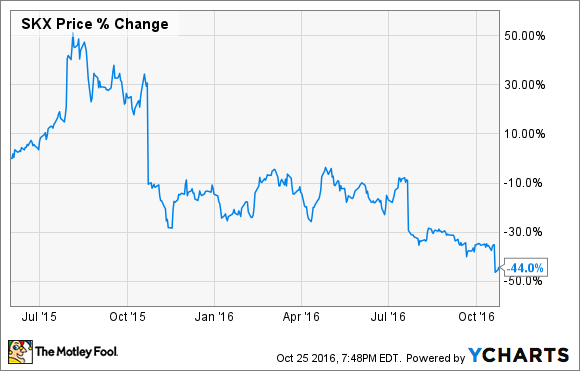 If you purchased Skechers (NYSE:SKX) stock last summer, nothing that has happened since has come as welcome news. For investors searching for a bargain, though, the months of bad news have made the shoemaker's stock worth taking note of. The company announced third-quarter results on Oct. 20, and investors were disappointed once again, sending the stock down 17% the next day. The top line grew by 10% during the third quarter, and year-to-date sales hit a new record of $2.8 billion, up 17% from 2015, but profitability was elusive, with diluted net earnings per share dropping 2% year-over-year to $0.42. The worst part of the report was that sales of $942.4 million were below the company's own guidance of $950 million to $970 million. Adding to the angst investors were feeling was a fourth-quarter sales outlook of $710 million to $735 million, merely in line with last year's fourth-quarter sales of $723 million. In the midst of all the negativity, it might be hard to remember that this is a company that just grew sales and profits 15% through the first nine months of the year. Here are some other things to consider. SKX price percentage change data by YCharts. When "good" is "not good enough"
A year ago, Skechers was riding high. With top- and bottom-line growth on a tear and the "athleisure" clothing style being what all the cool kids were wearing, it seemed that Skechers' double-digit growth would last forever. The stock has been clobbered, though, as results, especially on bottom-line profit, have missed analyst hopes in three of the last four quarters. U.S. sales have been pressured by competition from other shoemakers, and the subsequent discounting to fight back has hurt. International sales have been a bright spot, continuing to grow in the double digits, including 18% in wholesale and 16% in retail during the last quarter. A strong U.S. dollar in relation to other currencies, though, has kept a stopper on profits. A strong dollar lowers the value of sales in other countries when they're converted into dollars, and the company reported a near-10% negative impact to profits as a result. Investing in further overseas growth is still the plan for Skechers. International sales now account for 48% of total revenue, and the company is on track to open another 15 to 20 stores and complete its new European distribution center by year's end. It bears noting that those openings also pressure the bottom line in the short term, with management anticipating $5 million to $10 million in expenditures as a result. It's easy to play Monday morning quarterback and complain about Skechers' stock performance. But what about going forward? Is this stock now a value investor's dream? The market's mood has gone completely sour on the shoe company, which makes me a buyer. After the last year of beatdown, shares are trading at 11.5 times trailing-12-month earnings. That is a valuation usually reserved for companies that are no longer growing businesses, not one that is averaging double-digit growth in the last year. By comparison, rival shoemaker Nike only grew profits 6% last quarter, but still fetches a price-to-earnings ratio of 23. 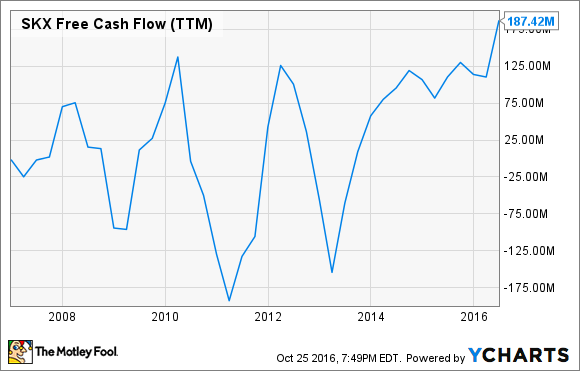 SKX free cash flow data by YCharts. While it's possible overpessimistic sellers could drive share prices down further in the short term, I think Skechers stock spells opportunity.